Why another Dichterliebe recording? Because Gerald Finley has simply one of the greatest voices of his generation, and is an artist at the peak of his powers. He brings to this noble song cycle the supreme technical ability and penetrating musical understanding that characterize all his performances, whether on the concert platform, in the recording studio or on the great opera stages of the world. This is his fourth disc with collaborator Julius Drake, and the partnership has proved to be a uniquely rewarding one. This fine recital also includes many of Schumann’s other Heine settings. The extremes of elation and despair in Heine’s poetry stimulated Schumann to write some of his most poignant and unforgettable songs. This is truly a disc to treasure. Schumann: Myrthen, Op. 25 – 21. Was Will Die Einsame Träne? In close collusion with the ever-sentient Julius Drake, Gerald Finley gives one of the most beautifully sung and intensely experienced performances on disc of Schumann’s cycle of rapture, disillusion and tender regret. This is a Dichterliebe firmly in the past tense, the poet-lover achingly resigned from the outset. Finley sings the second song, “Aus meinen Tränen”, as if in a trance, and lingers luxuriantly, even masochistically, over the remembered “Ich liebe dich” in “Wenn ich’ in deine Augen seh’”. Yet here and elsewhere some dangerously slow tempi are vindicated by the acuity of his verbal and musical responses. Where most singers, including Christopher Maltman in his fine performance with Graham Johnson (Hyperion, 5/01), end “Im Rhein” in wistful tenderness, Finley infuses his final words with a wry bitterness. The disenchantment of “Ich grolle nicht” (where Drake evokes Cologne Cathedral with a hieratic depth of sonority) is already glimpsed. In the cycle’s latter stages Finley veers between numb reverie and acerbic – and authentically Heine-esque – self-dramatisation. The birds’ assuaging response in “Am leuchtenden Sommermorgen” is magical, barely breathed, the mounting trauma of the funereal dream-song “Ich hab’ im Traum geweinet” chillingly conveyed, the dissolving vision of the penultimate “Aus alten Märchen” relived with ineffable sadness. Adding a cutting edge to his warm, mahogany baritone, Finley imbues the final song with savage irony, before the rueful, healing close. Throughout, Drake’s playing is a model of clarity and acutely observed detail (he is more attentive than most to bass-lines), epitomised in his fluid, exquisitely voiced epilogue. Singer and pianist are just as compelling in the other Heine settings here. Finley is eerily insinuating in “Mein Wagen rollet langsam” – one of four Dichterliebe discards – where Schumann’s music is in danger of sounding too ingenuous for Heine’s sinister verses; and he and Drake throw themselves into “Lehn’ deine Wang’” with an impulsive ardour I’ve never heard equalled. Finley times and colours the biblical ballad “Belsatzar” with the art of a master dramatist, gives an uncommonly – and effectively – introspective reading of “Die beiden Grenadiere” (even the opening is hushed and anxious), and spins a rapt, dulcet line in the two “flower songs”, “Die Lotosblume” and “Du bist wie eine Blume”. The church acoustic is more resonant than I find ideal for Lieder, though that hardly detracts from a glorious Schumann recital. Gerald Finley and Julius Drake follow a series of outstanding albums of American and English song – Ives, Barber, Stanford – with Finley’s first foray on disc into the German Lied, and the results are just as impressive. 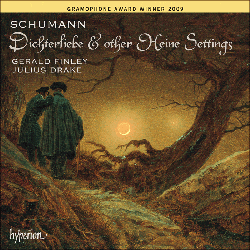 There may be three-quarters of a century’s great interpretations of Dichterliebe already available on disc, but Finley’s stands up well against the best of them, including the series spanning a whole career from Dietrich Fischer-Dieskau, who set the benchmark where baritone versions of this song-cycle are concerned. Finley is a much less knowing, more direct performer than Fischer-Dieskau, concentrating less on precise verbal nuance (though his German diction is wonderfully clear) than on more generalised expressive contours, but the effect is still overwhelmingly powerful. Alongside this greatest of all Schumann’s song cycles, Finley lines up another 16 settings of the poetry of Heine, and brings them all to life equally vividly, whether it is the over-the-top dramatics of the ballads Die Feindlichen Brüder and Die Beiden Grenadiere, or the tragic triptych of Der Arme Peter. Apart from the Op 24 Liederkreis, Finley’s first album of German lieder collects all of Schumann’s settings of Heinrich Heine, including four songs intended for Dichterliebe, but published later as Opp 127 and 142. The Canadian baritone is a little younger, at 48, than Dietrich Fischer-Dieskau was when he recorded his comprehensive Schumann song survey for Deutsche Grammophon (1975-77), but, vocally, he is in his prime. He brings eloquence to the text and maturity to his interpretations, but with a still youthful-sounding voice. Darker and more “bassy” of tone than Dieskau, he is especially impressive in the sardonic and bitter songs: Die beiden Grenadiere (The Two Grenadiers), Ich grolle nicht (I Bear No Grudge), Das ist ein Flöten und Geigen – about the wedding of the poet’s beloved to another man – and the concluding Die alten, bösen Lieder (The bad old songs), in which the operatic cutting edge of his baritone, soaring gloriously at the top, brings dividends. Finley is a gripping narrator, too, in the tale of Belshazzar’s feast (Belsatzar), and can refine his voice to the most arresting of internalised confidences in the love songs to Clare Wieck (most of the music here dates from Schumann’s annus mirabilisof songwriting, 1840). Die Lotosblume, Du bist wie eine Blume, Dein Angesicht so lieb und schön and the doleful songs from Dichterliebe are delivered on a thread of tone, yet Finley, aided by his sensitive and forthright pianist, Julius Drake, never sounds mannered. Let’s hope he goes on to record the Heine and Eichendorff Liederkreise as a sequel to this outstanding disc.